I just got the results of an at home sleep study from 1-2 weeks ago. Would like some help interpreting a particular part of the results in the report I am unclear about. "Arousals were normal in frequency & predominantly spontaneous in nature. Respiratory AI = 1.3/hr. PLM AI = 1.0/hr. Total AI = 19.0/hr." What I am confused about is the "Total AI" and how/why it is so high when the other two AI figures quoted are low? What does it mean? 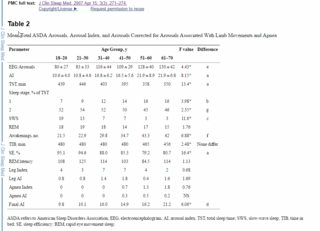 According to the doctor the results show the treatment I am receiving is successful in addressing my sleep apnea but how can that be so if I have 19 arousals per hour? The sleep efficiency score was 93.4%, which also does not make sense to me in light of the above quoted figure. Looks like your in good shape unless you are feeling excess daytime sleepiness. An arousal refers to a change in the level of sleep, and we all have many over the night. Sleep efficiency is just the amount of time you were sleeping divided by the time you are in bed. Thanks for that info. Clears things up a bit regarding the report. Unfortunately I am still experiencing extreme daytime sleepiness... If the apnea is being successfully treated like the report suggests I have no idea what's going on with me. Definitely not in a good place. How long have you been getting treatment for sleep apnea? It takes some time to recover. Some of us lucky ones seem to start feeling less daytime sleepiness almost immediately, some take more time. Also, while I believe that home sleep studies are great for screening, I am not a big fan of them as detailed diagnostic work. Other very strongly disagree, but you should talk to your healthcare provider that you are still feeling daytime sleepiness, and what the next step should be. There are so many possible causes of daytime tiredness beyond SA, depression, anxiety, thyroid, stress, heart disease, fibromyalgia, chronic fatigue and on and on.